The focus of the Weber State CAST program was to provide students with senior projects in space based applications, credit for which was applied to the students curriculum for graduation. There were several projects that students were involved in, however, without exception the biggest and most impessive was a project to build a spin balance machine that would provide data to back calculate the center of gravity and moments of inertia of a satellite payload placed in the carriage of the machine. As lead mechanical designer for the CAST department I was the primary point of contact for the professor and student team which engineered and built the machine system. Below are pictures of the machine concept which is still in use at Weber State by the mechanical engineering department of the Applied Sciences College at Weber. 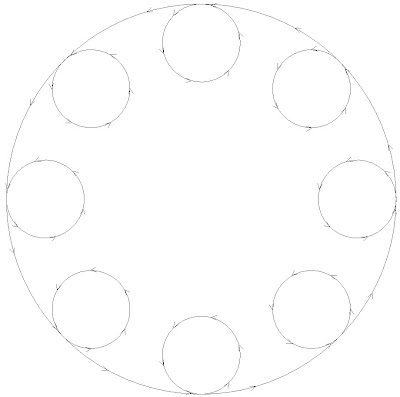 The spin of the machine resulted in the circular pattren shown here. Additional projects conducted by CAST included WeberSAT, Phase 3D, and CatSAT. One of the primary goals of the organization was to provide the bus of a satellite system which could perform everything necessary to make a satellite work, except the experiment. Hence the development of the ACP and MPA systems designed to provide an "off the shelf" commercial product which was robust enough to opperate in LEO orbit at any angle of ascension. CAST had quite a few sucesses with off-the-shelf products integrated into satellite systems. WeberSAT used a COTS ccd camera of the type that is used for security purposes as a primary camera for ten years to take pictures of earth.